We collect coffee grounds everywhere we can get them. With almost an acre of vegetables we need about a tractor trailer load of compost each year..vegetables are heavy feeders and we do not use anything else to grow them but compost..and coffee cuts down on any odd odors that might occur as compost is being made. 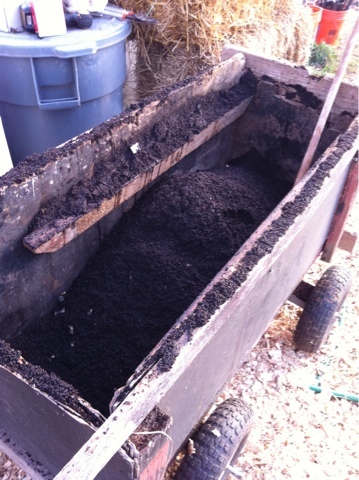 Homer combines all sorts of things to make compost, and an entire wagon load of coffee grounds is like..paydirt! The sawdust from the sawmill around the corner, bits and pieces from the farm that no one eats..and when we visit areas where leaves get raked and bagged we will..fill the truck with the ones in brown paper bags..and put bag and all into the compost pile..makes for very happy worms!